APN of Airtel for Android Samsung, Micromax, Sony. APN Stand for Access point name. If your internet is not working, One of the possible cause may be, because, APN setting of Airtel is not set in your mobile phone. 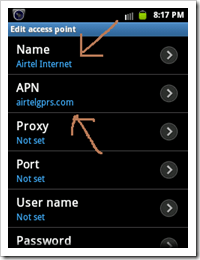 Airtel Service providers Customer care are unable to deliver settings sometimes in some mobiles, so you need to set the apn settings manually. I had faced the same problem in Samsung galaxy S, which made me to write about this information here. If your droid phone does not get the APN setting from other service provider like : Videocon, Vodafone, Airtel, Aircel, Idea, Tata docomo, Bsnl, Reliance, MTNL etc, then you can refer here for solution. Here is the way to set apn settting in your mobile. We can set APN in every mobile but, i will demonstrate to set apn in android mobile step by step, in this post. 1.) Select Settings, then Wireless and Networks and to Mobile Networks, which will flow as Settings -> Wireless and Networks -> Mobile Networks -> Access Point Names (APN). For adding new APN setting, selects option button of your mobile and select “New APN”, or you may even edit the existing APN by selecting edit. 4. )Select option, and then save this setting. I suppose that, after setting APN of Airtel in your android phone or tablet, would make your internet connection work properly. You may also read How to make 3G or HSPA internet connection work in Android. If you are having problem in accessing internet, post your comment below, and we will look upon that. 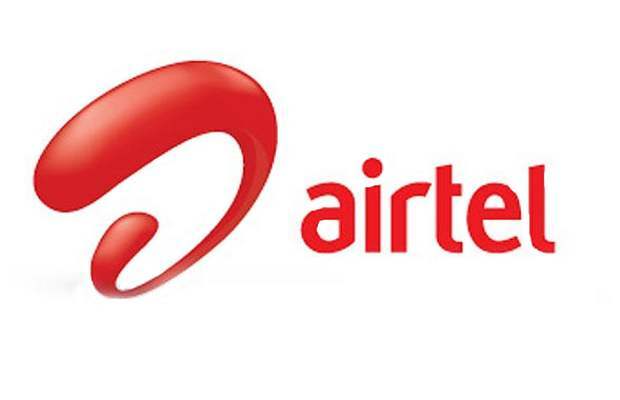 Disclaimer: Although, we have taken utmost care in gathering correct APN setting of Airtel service provider from our reliable resources and with our own research and experience, but we are not responsible for any inconsistency and inconvenience in accessing internet as we not a part of any of the service provider. Below APN there is “choose Network operator” set the correct network operator and it will work. I have HTC desire X dual sim phone . when I am trying to connect to airtel broadband , it is getting connected but not able to access internet . thanks dude… ur awesome. it really helped. Tried the above steps but could not connect to internet. my mobile is samsung , model- S5282. airtel net recharge. But can not open internet. my phone is micromax A35 bolt. in my phone airtel internet works for 5-10 mins but after that stops working and then i hav to disable data connection for 4-5 mins and then enable it to make internet start working again. im from northeast shillong meghalaya. wat to do? my android phone Gionee not opening net page. Hay there ..thank a lot now my net on android phone started after followed above steps. Thanks to both of you!! Gautham and the original author of this post. I’m from maharashtra. But i put my sim in new sony tipo in hyderabad. Roaming internet not working. What should i do now?? I have bought new DOMO tablet. I am unable to connect to 3G network using airtel dongle. Even after following the steps and saving at the last step. The APN is still not visible. Rest of the fields I left as it is. After Saving the new APN doest appear. Request any one to help me to solve. Just tap the button situated left to the home button, you’ll get the option for reset to default apn setting and select that.Then again you can try changing that default apn settings. I tried ur advice on d settings and also dat on apn type and there still is no result…..
how i apply 3G net settings for samsung android 5282????? tried on my new sony xperia e dual but no internet connection………. I m unable to connect internet in my Sony Experia M (model-c2004) mobile. I did the settings as per above description and I have recharged the SIM by Rs-149 2G pack. But still I m unable to connect to internet. Your support is Highly require for me. I have gionee E3 android mobile, I had gone through same steps, when I click on save than all those setting disappear from cell. and can not see original uninor setting. just tap the button left to the home button, you’ll get the required option. tried the above steps. putting APN TYPE – Internet, not worked. then changed APN TYPE to default,supl.. still not working. someone please help. Unable to receive 3G network on my VIVO Y20t mobile. im using airtel service. They say they dont have 3 G settings for my model mobile.. kindly advice.. I m unable to connect internet in my Sony Experia M (model-c2004) mobile. I did the settings as per above description and I have recharged the SIM by Rs-145 3G pack. But still I m unable to connect to internet. after doing this it has automatically selected aitellive??? 2g Apn settings of airtel for penta tablets. Please tell! Tried the settings but mms cant be sent or recieved everything else works fine . I am using a Motorola Droid Maxx – android version is kit kat 4.4 . I can’t use the 3g on my Sony expiriya c5302, send me settings. Am having airtel 2g internet and from past 1 & a half month, mobile internet is not working at all properly inside my home whereas its working well outside anywhere. My APN settings are also perfect and signal strength is also very good but still internet is not working in home, customer care told me to change the sim card as am using a very old sim card but even after changing it, its not working, please help, Thank you. Thanks a lot , my Internet’s now working on my Samsung Galaxy S Advance. Just had to set the auth.type to none and the APN Type to Default. Airtel internet is not working in my Micromax Canvas 4. Done with all the steps mentioned above. My airtel . My 2G net pack was working properly and expired last week. Today, I recharged 2G net pack. But, internet is not connecting even though I set APN as per your above advice. Please advice and arrange to connect internet. I m unable to connect 3G internet in Gujrat in my Sony Experia M (model-c2004) mobile. I did the settings as per above description and I have recharged the SIM by 3G pack. But still I m unable to connect to 3G internet in Gujrat. I use airtel Rajasthan No. I tried it and it now works perfectly.. 😀 thanx a ton! Sir aitel 3g is not working properly on my hp 7 slate voice tablet.whenever I swith on it just within 5 to 10 minutes the signal disappeare and the connection become lost further I hve to again make it switch on it to get the signal.pls sir tell me what should I do in this case…. I tried all for ASUS Zenfone 6 but it not worked what I do. My airtel 3g/Vodafone 3g both are nt working in my flat, bt as i come out of my flat it starts working.. When i’m in it works in 2g mode.. So i want to know that how can i get rid of this.. I want 3g to work in my flat also as it is working outside..
My handset is Lenovo S820. The internet was working in my mobile properly with3G speed. After upgrading the OS to android 4.4.2 it worked for few days and then suddenly one day it stopped working. I have tried the above settings but didn’t worked. my handset is lenovo S 850 and the connection is Airtel of Uttarakhand. But at present i live in Haryana.. I have se all the setting in APN , But no connetion started. Please suggest for internet setting. I have Samsung Android model no. GT-S7582 and connection is of Airtel even after setting APN I am unable to get internet connectivity on it. please help. my fone is asus zenfone 5 ,after doing still no internet connection. Am using MTN Smart Mini S620, But i have tried setting my APN settings but is not working out. Is it important that i must send INTERNET to 232. Please i need an urgent reply. hello, i am using sony Xperia m with airtel network, the problem is that i can’t connect to 3g network. put the preffered network mode as WCDMA ONLY and switched off and reboot then made wcdma/gsm and manually searched for airtel 3g but didn’t get there network, when i called airtel cc they said connect with idea 3g, if you don’t have airtel 3g. and the Internet setting APN is same as you mentioned above! is that anything else to be considered? Hey.. My intex aqua curve mini… Only airtel net not working…while installing confg pin is asked bt nothng is working like 1111 ,1234, 0000… And also after all steps of manual setting…not worthy… Pls help..
My Mobile set is Samsung gt-s7582 .I have been using Airtel service and also i have been using 3g for past 6 months.But suddenly for the past 1 week , i am getting only 2g services.Contacted the Airtel customaer care center, but there was no proper response.Is there any setting by which we can check in the mobile set whether 3 G is working ? The above steps are not working in my Sony Xperia M. Are there any other settings for the internet? yaar mere airtel east ki setting save karne par enter pin likh kar aa raha hai…. This helped me a lot. I have an unlocked BLU 6.0 HD phone, which is their ltest phone. In Bangalore, I was not getting 3G data. Several AirTel personnel played with it and told me that the phone set supports only 2G. I couldn’t believe that the latest model of an American made Android phone will support only 2G! Finally, I followed the directions stated above, but with APN Type: default, and it worked with 3G! Thank you a lot for this help. I am unable to see the APN setting in ASUS 7 fonepad. As a result, I am unable to configure my 3G Airtel dongle to use it for web connectivity. Please guide me as to how the APN settings in the fonepad can be enabled and visible. I have Micromax Android A177 canvas juice and connection is of Airtel even after setting APN I am an able to get Internet connectivity on it. Please help. My problem is sot out. I recharged my airtel with 3g recharge. but it is still working on 2g. Previously i’ve used 3g on my mobile but this time it is not working. one day i selected “only gsm” and after that i changed it to “wcdma” n then on “auto mode” since that day my 3g is not working. what should i do.? i chose airtel in network operator then i chose automatically switch to preffered network operator… still not working. ps- please mention my name in ur replies so that i could identify the reply for me..
i’ve recharged 3g but my 3g is not working. its still working on 2g what should i do.? I bought a new Xiaomi Mi 4i phone. I am using Airtel 2G for data. All required APN settings are done properly which got installed automatically and it also shows internet connection with E and double arrows. Eventhough I am not able to access internet. Can you please help. I have samsung s7262, i have all these settings mentioned above,still m having problem using internet. Please help. After Saving, the new APN doest appear. I am using Sony experia C2104 mobile handset. Off late my mobile internet connection is not working at all in some places. The internet connection with E is not showing at all. Kindly help me fix this problem. Hi, in my lenovo tab A3500 ,when setting 2g only ,internet and GPRS working if I change settings to 2g/3g auto and try to connect to net or GPRS ,it saying ” no connection available ,I checked in many places, there is 3 g in another mobiles ,I am using airtel 3g prepaid service. Please any help. I recharged 3g on my mobile micromax bolt AD3520.but it doesn’t open. Why can i do?please help me. It works 2g properly fast. Thanks, i want for iPhone airtel. Please help me! your machine to any magnetic metallic surfaces or one among our magnet mounts. I have followed all the steps given above for Micromax Canvas Nitro A311 with Cyanogenmod 12.1, but still the data connection of SIM – Airtel is not connected. Pl advise. I am able to set APN as APN option is not active. I am using HTC desire C handset. I took new SIM card of Airtel with 4G internet but as it is not compatible I am trying for 3G settings but due to APN option deactivated on my handset I am unable to set 3G settings as well. Sir, I got APN settings but still internet is not connecting… MY device is MOTO G2 2nd generation (model: XT1068) .Please help.